Borderlinx | Buy Nine West and ship worldwide with Borderlinx. Cheap rates guaranteed. Step out with confidence sporting a fantastic pair of distinctive, powerful Nine West USA shoes. Pumps, boots, flats, sandals, and more alongside gorgeous accessories such as handbags and scarves are the specialty of Nine West USA, which has been trusted by customers to bring them only the very best products for decades. Nine West USA has been bringing industry-leading fashion in footwear, accessories, and more to customers for over 30 years. Explore hundreds of styles from leading designers today, and discover the head-turning effect you'll have with the help of Nine West USA. Nine West USA is proud to offer some of the most stylish pieces in footwear, whether you're heading to the office or out to date-night, and there's something amazing to be found to suit every unique style and personality. Nine West USA footwear is available in an incredible selection of styles, types, colors, and prices. With some footwear starting under $50, there's something for every pocketbook as well. Nine West USA accessories are the perfect way to top-off your outfit and make you glamorous and comfortable with items such as chic, trendy scarves, and gel inserts for just about every type of shoe. 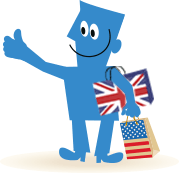 With Borderlinx, customers international can now buy Nine West in the USA today! Cheap shipping, tax & duties are calculated upfront by our Shipping cost calculator, and Borderlinx will then ship your order to your home. International ordering from Nine West USA is hassle-free through Borderlinx, with services including concierge, free repacking and consolidation.